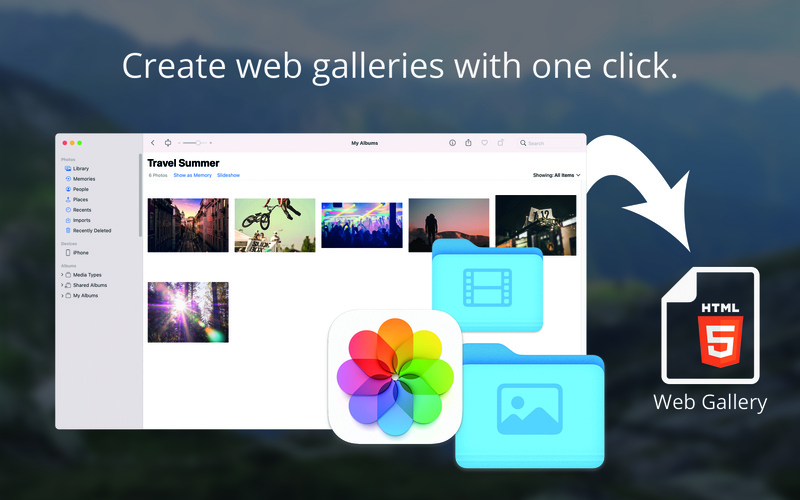 Create beautiful web galleries based on your Apple Photos library. photos2webgallery creates a beautiful gallery for all modern browsers – based on your Photos library on Mac. Your visitors will love it, just share the generated HTML output folder with your family and friends on any possible way – e.g. via your personal website, via your external storage or via USB. It’s easy and it only takes a few moments. The web galleries generated by photos2webgallery will not only include your photos but also the videos of your Photos app library. 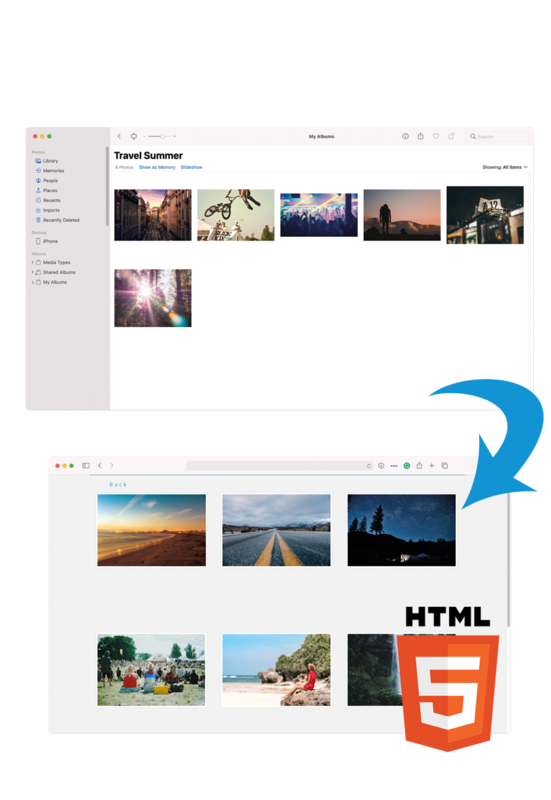 And the integrated HEIC to JPG image format converter will guarantee wide compatibility in terms of browsers and operating systems of your visitors even if your Photos library contains Apple-only image formats. Not just your photos but also meta information. Make use of useful meta tags in your Photos library: Display the date, the time and even the image location (Apple Maps/Google Maps) of your pictures. You and your web gallery visitors will love the experience with many details, high functionality and beautiful slideshows with stunning images. photos2webgallery is powerful, easy and fun. Let's take a look. 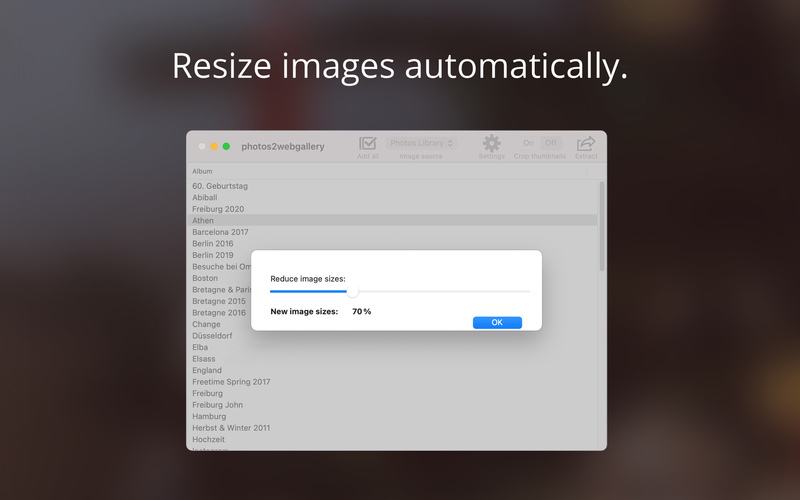 Create responsive photo HTML galleries directly from your macOS Photos library albums. Share the generated HTML output folder with your family and friends on any possible way – e.g. via your personal website, via your external storage or via USB. It’s easy and it only takes a few moments. There is more. Display meta information of your photos. Not just your photos but also meta information. Make use of useful meta tags in your Photos library: Display the date, the time and even the image location (Apple Maps/Google Maps) of your pictures. You and your web gallery visitors will love the experience with many details, high functionality and beautiful slideshow effects. 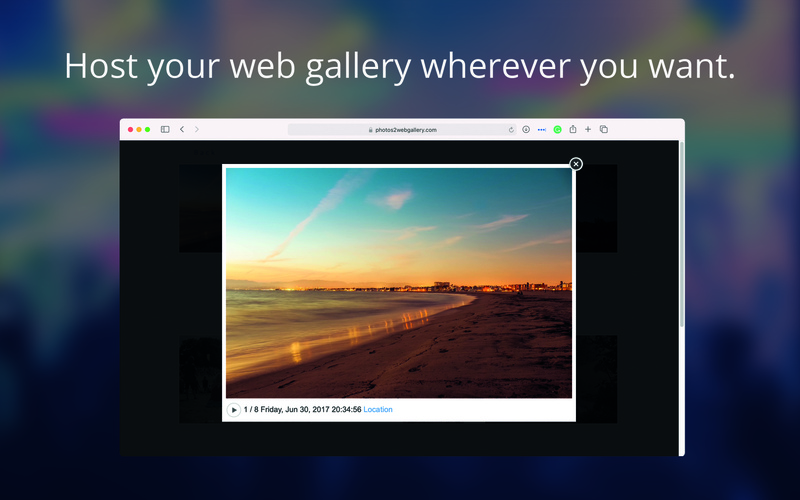 Take a look on the beautiful and easy user interface of the photos2webgallery macOS app. Meet Mike and see how the photos2webgallery helps him in his daily work. Take a look at reviews from newspapers, blogs and our customers. You have feedback for us as well? Mail us. 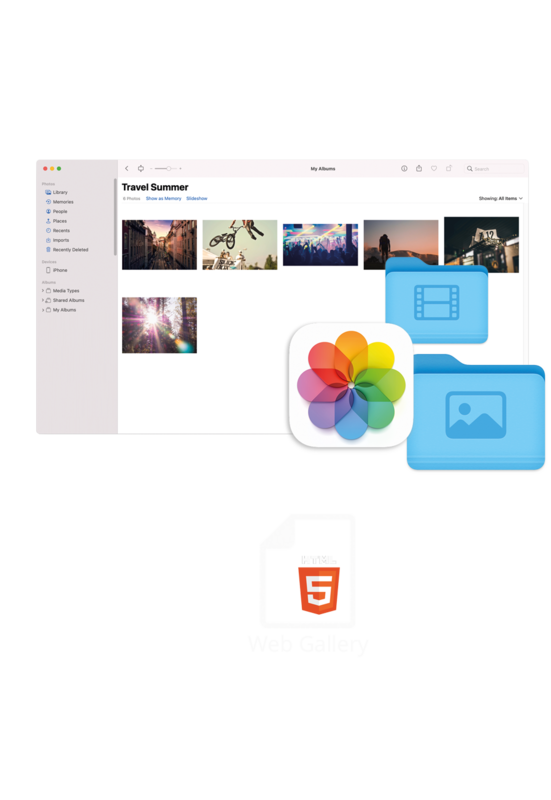 "photos2webgallery allows me to share my photo library with my family without using external cloud services like iCloud." "My customers love the web galleries and for me it's super easy to export and share them on my website." "I love it! Simple, functional and powerful." Questions, suggestions or feedback? We would love to hear from you! What can photos2webgallery do for me? photos2webgallery is an app for macOS. 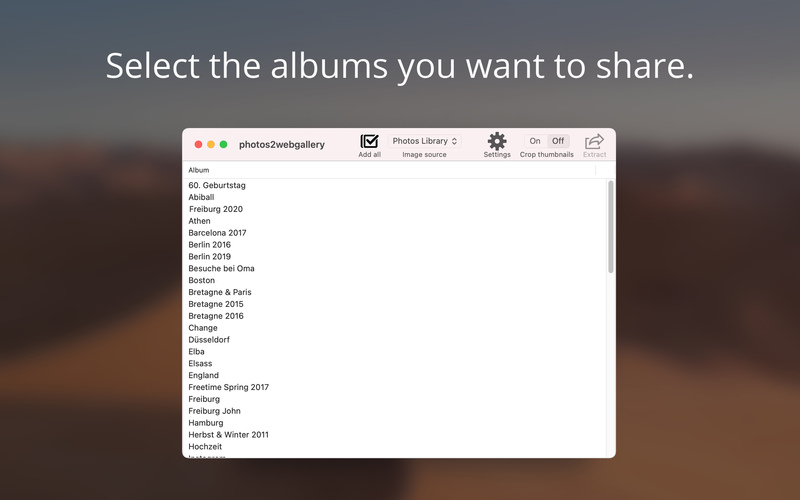 It allows you to create lovely photo web galleries directly from your Photos library on Mac. 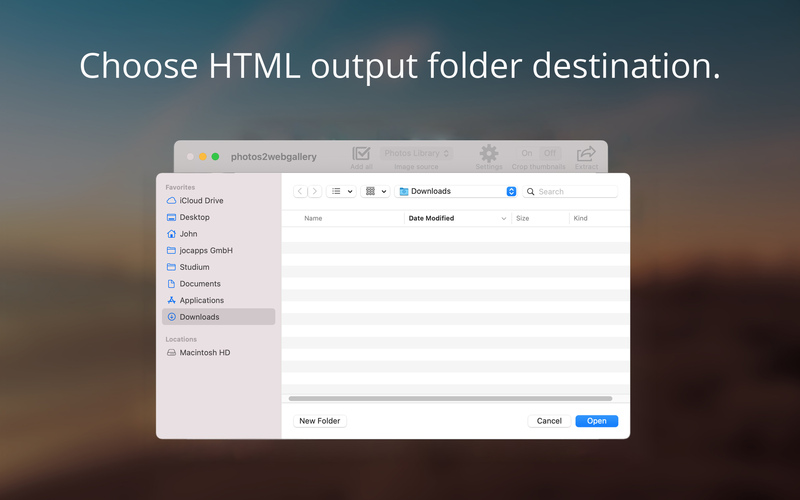 Share the generated HTML output folder with your family and friends on any possible way – e.g. via your personal website, via your external storage or via USB. It’s easy and it only takes a few moments. Just a Mac computer running macOS 10.13 or later and your photo albums in Apple Photos library. The integrated HEIC to JPG image format converter will guarantee wide compatibility in terms of browsers and operating systems of your visitors even if your Photos library contains Apple-only image formats. 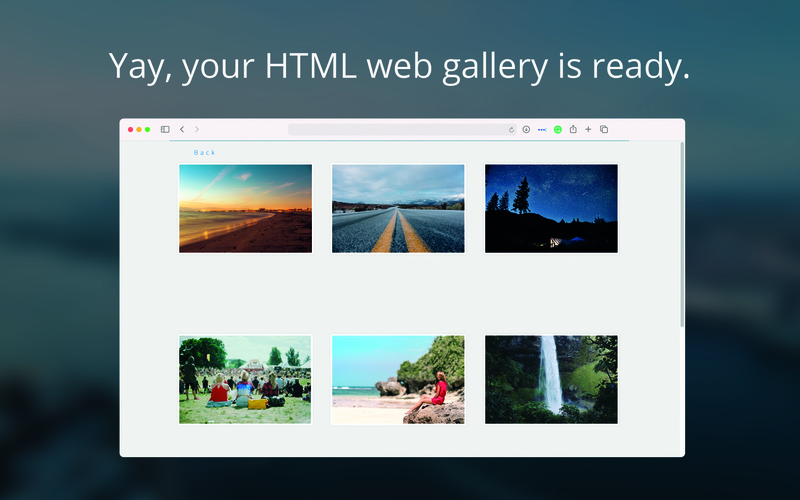 Can I see a demo web gallery? Sure: https://www.photos2webgallery.com/demo-webgallery/. By the way, you can change the design easily (via CSS) or you can integrate the gallery into your existing website design via an iFrame. What's new in the latest updates? Any feature plans for the future? Designed and coded with lots of and in Germany. Made for everyone and made with 100% renewable energy.